This is Marideth Sisco for These Ozark Hills. I had only about one toe in the Ozarks this past weekend while I and some companions visited friends and family up near Columbia. Our aim was to reconnect with a young woman we’d known almost since birth, had sometimes helped raise and had stayed behind as she went on her way into adulthood. She’s in her mid-thirties now and is bright, confident and remarkably self-aware. Her closer family, in welcoming these former adjunct mothers, planned some small outings to entertain us and show us the area where they lived. And they did. But one of them in planning the outings, happened on some fellows I had met earlier, in other circumstances, and it was here our voyage veered away from its original intent and headed us off into the cosmos. Really. It was a good reminder of how all things connect, whether or not we see the connection. My story begins much earlier, when I was invited to speak at a meeting of the Missouri Master Naturalists at their state gathering up at Lake of the Ozarks. At that meeting I met a woman who thought I’d be a good speaker at another gathering, this one of Missouri River Relief, an organization that has taken on the task of tidying up the state’s big rivers. So I went, met them at St. Joseph, told them a story or two, and marveled at both their success and their stamina, for they had gone out that morning with several boatloads of volunteers with the temperature on the river a scant 26 degrees, and filled two giant dumpsters with everything from tires and mattresses to junked cars and waaay too many formerly owned diapers from that cold river. It’s what they do. They organize all year gathering volunteers and support for six “major” cleanups, and spend more of their own energy and knowledge in supervising other groups and organizations in cleaning smaller streams. That night, after the first day of the cleanup and the talk, they sat me down at a campfire beside the river and told me the story of that place. We were sitting within a stone’s throw of the very spot where pioneers headed west crossed the Missouri River and drove their wagons right off the map, led by a guide who simply followed a track through the grass that would take them through Kansas, Nebraska, Wyoming, and all the way to Oregon, if they lived.Whether they did or not, no one they left behind would ever know. It was on this spot, they told me, that someone among a band of settlers coming from the Shenandoah Valley of Virginia penned a longing lament that became a popular song of the times, called simply Shenandoah. They explained, saying the song had become so popular among the flatboaters and other rivermen that it had traveled to St. Louis, then to New Orleans and across the Big Pond to England, where people had never heard of Shenandoah, nor did they know what it was. They changed and added to the words until it made sense to them, and then they sent it back to us. The songwriter had been singing to the river, not to an Indian chief. I thought about that all night, and by morning, had put the words back to where I thought they might belong. And last weekend, in the dusk dimly lit by the eclipsing moon, and with considerable help for these old bones, I and a quartet of companions boarded the giant 24-foot-long jon boat of the River Relief and headed upriver from Cooper’s Landing, toward St. Joe, to wait for the clouds to part so we could view the rare and elusive total eclipse of the supermoon. After an hour or two drifting down and motoring back up again, the clouds opened into a wide bowl of sky, and there she was, a dark, rusty eye, just beginning to open in a vast field of stars made visible by the earth’s shadow cast on her face. We howled at her. Dogs and coyotes some distance onshore howled back. I sang the song. Then we sat in the profound darkness as it slowly lightened, listening to the water’s song, marveling at our own insignificance in a vast, wondrous, living universe in which we are all merely along for the ride. It’s just a suggestion, but if you have a Christmas list or are looking for activities and organizations worthy of a small endowment, consider adding to your list as I am to mine the river keepers of Missouri River Relief, who work so hard and are so generous of spirit, who chose to share with us this gift, a blessing beyond measure that they could just as easily have kept to themselves. This is Marideth Sisco, from the edge of the Ozarks, on the edge of a small and fragile planet, at a rare, brief moment in time and space when it is granted the power to darken the moon, and we its tiny creatures the eyes to see it. This is Marideth Sisco for These Ozark Hills. We here in the hills have been asked recently to do what most of the folks routinely have had to do in other parts of the world, that is, to adapt gracefully and with some ingenuity to enormous changes in our environment. We’ve gotten off easy so far, most of us. Grace and ingenuity can be easily seen demonstrated by south sea islanders who voted recently to just disband their country and move elsewhere when rising sea levels were literally washing the ground from beneath their feet. They simply declared their country to no longer exist, and left to cast their fates to whatever wind would take them to another, safer land. And they did it in the nick of time, because there was barely enough dry land on their land for them to stand while voting. In other places, lines of refugees more than a mile in length flee a combination of war and famine, not chanting let us in or give us jobs, but simply We are human. We are human. Here in the Ozarks, it’s another story, with farmers struggling against ongoing, too ample rain that makes grass grow tall, but not enough dry days to cut and cure it. My farmer landlord has bided his time, glad he didn’t fertilize those bottom fields too heavily, and waited for August to, well, act like August. Finally this morning, with August having turned the corner into September, he drove up outside, unhooked the brush hog and attached the haybine behind his tractor. Seldom heard words in the Ozarks, about a seldom-seen act – a second cutting, in September, due to excess hay in the field. An uncommon occurrence here and due, apparently, to a too-active Pacific El Nino. Trouble is, now the weather gurus have posted their finding of a significant risk that the one approaching our western coast and due to start demonstrating its power sometime this winter will be even bigger and reach even farther east. So about the time we finish dealing with overgrown pastures and too much hay, we can expect snow, heavy snow and then more snow. After reading about that I put a post on my Facebook page that said I would soon be moving more wood closer to the basement door and hence within easy reach of the furnace. Whatever generation we live in and however our climate is behaving, we have learned the hard lesson that change is inevitable and that whatever we expect is subject to change. The trick is, and always has been, to be flexible enough to adapt. I remember, for instance, the drouth in the early 90s that was only abated when hay from western states started arriving by the train-load and even the prisoners in County Jail volunteered to load the hay from railcar to pickup truck to save starving livestock. I’m so old I remember a similar, and worse, time in the mid-1950s when such largesse was not available, and some farmers couldn’t even afford gas to drive their suffering livestock to market, nor get a decent enough price to drive home, and so shot some cattle to end their suffering, in hopes the rest would have enough to stay alive. Those times are awful enough that we hope never to repeat them. One would hope such experiences would teach us to be frugal instead of profligate with our resources. To care for what we have. And to be generous with our neighbors who have it worse than we do. For that is the way of the Ozarks in which I grew up. But the world changes. And so, too, do we. Would that we could build another kind of pipeline, to send our excess water to desperate farmers in California who have provided us with a vast bounty of fresh food these many decades but are having to resort to watering crops with waste water from the oil fields just to keep crops alive. Even if they succeed, will we want to eat them? And here in the country’s middle, where the breadbasket still thrives, albeit with its own problems of overgrowth and too much rain, we do not think of how to help others, and respond to the news of hunger at home and abroad with a whining stinginess that suggests such others outside our own enclaves should just fend for themselves. One would think Katrina had cured us of the “sink or swim” doctrine of social progress. Time will tell. For a new El Nino, when it strikes California, will bring heavy rains to a country virtually devoid of vegetation. The water will have nothing to stop it, and it has the potential to bring a level of devastation more vast than we can imagine. I lived in California, in the mountains of the central coast in a normal rainy season and saw how a single mudslide could bring whole communities to a halt for days, sometimes weeks. How much worse will it be this time? And what do you suppose a head of lettuce will cost come February. So the world has changed, and it is my hope, as one who has lived here almost three quarters of a century, that we will elect, in trying times now and to come, to remember that we are part of a larger community, a larger family, and will turn our thoughts and our doors toward a more open way with our neighbors near and far. Hard times do not exist apart from us, even if we do not experience them directly. They are happening to our family, whose most urgent cry is likely to be we are human. We are human. This is Marideth Sisco for These Ozark Hills. Just posted Chap 1 of my new novel. Search details below. At my publishing blog <yarnspinnerpress.wordpress.com> you can now find Chapter One of World’s End, Book One of the Ozarkia series. Don’t miss it. Read along, subscribe for updates. Enjoy. This is Marideth Sisco for These Ozark Hills. Well, spring has come in the door, fitfully and uncertain, like a child who has done something probably bad, and doesn’t know if you know it yet. A warm day or two and then a burst of snow, and another. Rain maybe, but where it will fall too much or too little no one knows. Mother Nature is nothing if not fickle. Just like a woman, we say. Well, I’d like to say a little more about that. We’re also just coming out the end of Women’s History month, with names handed around – Alice Paul, Susan B. Anthony, Jane Addams – that we only hear once a year and can only sometimes remember what they were famous for. They did something. We think it was important. If we’ve studied history beyond the headlines we know that women have always been far more influential than was ever acknowledged. Did you know that when they held the big celebration in the 40s about economic successes of the new deal, the women who had been instrumental in that change were not allowed in the photograph. Actually one did sneak in at the side, but they cropped her out. When the leaders of the Civil Rights movement in the 60s rejoiced up on the stage at the March on Washington, the leaders who were women were not allowed on the stage. And today women’s wages are still 77 cents on a man’s dollar for the same work, and men are still trying to decide if women can be trusted with their own bodies. But that whole line of thought set me to thinking about all the women in my Ozarks life, and probably yours. 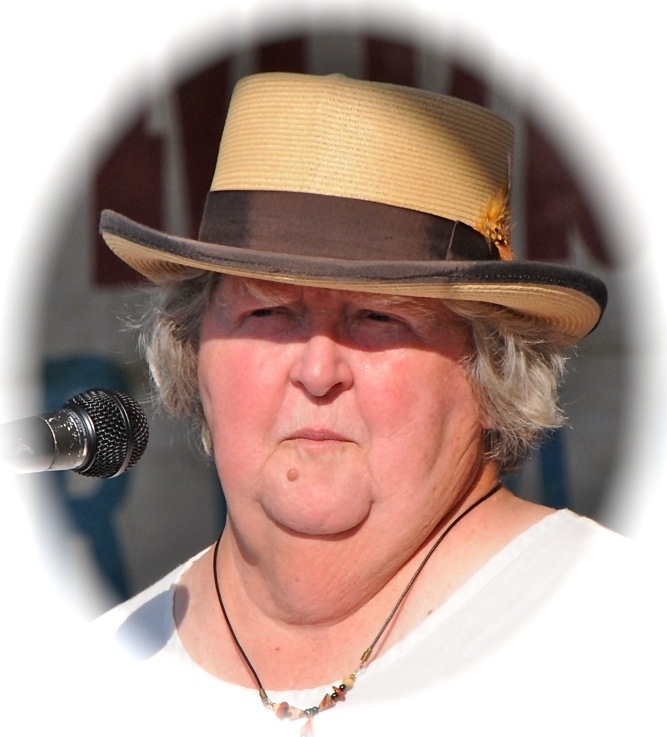 We had our stars, our Missouri Poet Laureate Mary Elizabeth Mankey, and the inimitable May Kennedy McCord, host of the long time favorite Ozarks Radio show “Hillbilly Heartbeats”. But there were others in these hills who were not famous except in their own families who just went about their business, did what they could and what they must, and never counted the cost. Never demanded that others ante up, do their part, give them their fair share, or a seat at the table. They were too busy fixing dinner, planting the garden, keeping up with the laundry. One of my most vivid memories of childhood was when my father came home early from work on a very hot summer afternoon. My mother was on the little utility porch in back, ironing. Because it was a secluded spot and such a hot job, she was ironing in her underwear. He thought she heard him come in. She didn’t. So when he stepped onto the porch and put his hand on her shoulder, she, in all her five foot one inch strength, brought her fist up from somewhere close to the floor, and decked him. They were both very surprised. And he looked very warily at her for a good long time afterward. She likely learned this from father, just like her sister, my aunt Juanita.It was understood in our family, you just didn’t trifle with Juanita. She wasn’t a mean person, far from it. No kinder little plump pretty lady you would never encounter. But she had, lets just say, an enhanced sense of fairness. She was never cruel to anyone. But if you messed with her or anyone in her family, she could be very, very fair. One legendary story about her came about when my cousin and her husband separated, and they had a child together, about two years old at the time. My cousin, her mother, and Aunt Juanita, her sister, had driven up to Monett, where a brand new Dairy Queen franchise had just opened. They were taking the baby and themselves on an outing to get an ice cream. They’d just arrived when the ex-husband pulled up alongside and asked to see his little son. My cousin handed him out, whereupon the ex-husband grabbed him, headed for his car and announced “you’ll never see him again.” A garden variety Ozarks domestic drama, even in those days. Well, they all boiled out of the car, the baby’s mother screaming, her mother screaming, trying to get the baby back without hurting him. They managed to pin the father against his car. But he was too strong for them, and it seemed all was lost. But then little Juanita ran around the car, climbed up on its roof, who knows how, and shinnied across. Then she put her index finger in the corner of his mouth and with all her strength yanked his head all the way around to face her. Then she leaned down, and said, calmly and gently, “Mo, you need to let the baby go or I’m going to have to kill you.” Well, of course, he let the baby go, whereupon she retrieved her finger and got down off his car. And they all went about their business, had their ice cream and went home. As you can imagine, the element of surprise figured greatly in the outcome of this story. But it was mostly my aunt Juanita. I am told that, having raised a family of five girls and one boy, my grandparents worried about their daughters’ safety. Then my uncle Roy was seriously injured trying to hop a freight train coming back from the Oklahoma broom corn harvest. So my grandfather was even more concerned, and he sat each of the girls down and had a talk with them. He told them to pay attention, to not put themselves at risk, and never, ever start a fight. But, he said, if a fight came to them, they would have to win it at any cost. My mother recounted his talk with her, when she, the smallest of them all, said, “but what if the other person is bigger.” Pick up a rock, he said. And that was that. Every one of the Gentry girls grew up fiercely independent, even though they all followed the standards of the time, married, had kids, trained them all, husbands included, in respectable behavior and good values, and fiercely defended their separate broods. Aunt Juanita never had children. She had everyone else’s. When her sister Neva’s husband was killed in a car crash, leaving her with a five-year-old, Juanita helped raise him. When my parents died, she finished raising me, and that took a very long time. She never faltered. She never lost faith in me no matter how scattered my wanderings or how wrong my choices. The women in our lives sometimes make all the difference in what kind of life we actually get to have. So the next time you give a thought to Women’s History month, along with the many strong and memorable women who spoke up, who marched and who started and participated in great social change, cast a look back into your own Ozarks past and give a thought to those amazing Ozarks women at the center of it, who helped shape your future, and made the life you have possible. This is Marideth Sisco for These Ozarks Hills. This is Marideth Sisco for These Ozarks Hills. Living in the Ozarks, it pays to be weather wise. We expect March to come in like a lion, and this March has proved no different. I’ve not been out but three times in as many weeks. Living in the country, alone, and at the road’s end, I’m careful about the weather. I shouldn’t complain, especially when the eastern seaboard is in such a horrific mess. It’s not nearly that bad here, it’s just miserable. The ironic thing to me is that, although I like living by myself and may spend weeks puttering around happily unaccompanied at home, the very fact I can’t get out makes me miss everyone horribly. I may not go to church for weeks, but soon as the ice sets in, I long for it, from the rituals all the way to the desserts. I miss just about everybody. And has anybody noticed that in just eleven days we have to plant peas and potatoes? I’m not sure the Ozarks commandment to plant spuds on St. Patrick’s day applies if you’re not Irish, and my forebears are mostly Scottish and English and Cherokee. But given the patchwork nature of our culture, I’m pretty sure there must be some Ulster genes in there somewhere. And yet who in their right mind, whatever their ancestry, would set foot in the garden as it will be next week, when the thawed and saturated earth means mud deep enough to steal your shoes. On the other hand, it makes me very grateful I decided in mid-winter to plant a smaller garden in the coming seasons. I realized I really don’t have to feed the multitudes. Even at half its size, my garden can feed more than me. And this extended period of houseboundedness has made that even more clear. Every time I go to the freezer in search of something for supper, I must face the more than 40 lbs. of perfectly good tomatoes I just couldn’t let go to waste, even though I’d already put up a year’s supply of salsa and sauces, and I was thoroughly tired of the process. They’re for soups and stews, I said, unwilling to just heave them over the fence. Now it’s March, and I haven’t touched a one. Nor have I even once made stew. Thus we are imprisoned by our own ancestral habits, learned from our Depression Era parents and pioneer Grandparents, whose vision did not stretch far enough to imagine an excess of food. Even if we had enough, there were our neighbors to consider. They might have fallen on hard times, or failed crops or illness. Or they might just have been foolish and profligate. In either case, without help from those more fortunate, they might starve. In those days, we understood that. It reminded me of another conversation with a Native American friend while watching the news, where a hefty, well dressed fellow was being named the new chief of some tribe. Thinking about all that, I realized that my large garden has its origins in my own parents’ little grocery in Butterfield, which they lost because they couldn’t bring themselves to deny credit to people they knew were going hungry. Behind the counter we had books full of itemized groceries that would never be paid for. But we also had neighbors whose children were hungry, while my mother had a steady job as postmaster. So we had plenty, as long as it lasted. We lived next to the railroad tracks, you see. And along with neighbors in need, she fed every passing hobo. And always had. It’s what neighbors do. We learned plenty from her. I’m confident that I’ll still have plenty in my downsized garden, if I can ever get into it. In the meantime, if I can make it out to the store before the next round of miserable weather, I guess it’s time to make stew, and with all those tomatoes, I can make plenty. This is Marideth Sisco, in a stew over the weather in These Plentiful Ozark Hills. This is Marideth Sisco for These Ozark Hills. Well, wouldn’t you know it. We just got finished celebrating or commiserating about 2014 and here it is 2015, and another New Year is upon us. Or is it? I’ve been reading up on the calendar, and it turns out the more I know, the less I understand. You know, trying to create a calendar to accurately keep track of the yearly circuit of this planet around the sun isn’t easy, especially when that planet completes its circuit in exactly 365 days, 5 hours and 49 minutes, give or take a few seconds. The first attempt at a calendar that we know about in the western world was the Julian Calendar, which, according to an outfit called dateandtime.com, was replaced because it did not properly reflect the actual time it takes the Earth to circle once around the Sun. That’s called the solar year. This meant that as time passed, extra days began to appear spontaneously, at the rate of about one every 128 years. Not something you’d notice before breakfast, but over time they began to add up, so that the date of the equinox, for instance, didn’t fall on the equinox. So cultures around the world, one after another, tried switching to something we called the Gregorian calendar, It’s where we got a solar calendar based on a 365-day year divided into twelve more or less equal months. Eleven of the months have either 30 or 31 days, while the second month, February, has only 28 days during the common year. About every 4 years, though, there is a very uncommon year, called a Leap Year, when one whole extra day is added onto that second month, and is when we get the day called February 29. It’s how the Gregorian Calendar accounts for that extra five hours and 49 minutes when the planet is behind schedule. This was better but still kind of incomprehensible book of days was named after the man who first introduced it in 1582: Pope Gregory XIII. Now Greg didn’t think it up. That was the work of a far lesser known man, an Italian doctor, astronomer and philosopher by the name of Luigi Lilio. He is also little known by an entirely different name, that of Aloysius Lilius. Whatever his name was, and who really cares, he’s the one who thought up the design, but he died before anyone paid any attention to it. Nobody quite remembers how we arrived at January 1 as the beginning of the new year, but it happened. And so the Gregorian calendar starts on January 1. But it didn’t always. You see, the Gregorian calendar let us realign the calendar with astronomical events like equinoxes and solstices. To get the calendar back in tune with astronomical reality, a number of days were simply and arbitrarily dropped in the new calendar, creating odd months with only 18 days and odd dates like February 30. ▪For instance, 10 days were dropped in October 1582. ▪New rules were set to determine the date of Easter. 3 – The year is also evenly divisible by 400. Then it is a leap year. Did you get all that? Yeah. Me neither. And it got worse. Not everybody made the change at the same time, so for more than a century, everybody was tinkering with the days on and days gone. And then there’s that Anno Domini or “the year of our Lord” business. You see, the dating system we use in the West is based on someone’s best guess as to the date when Jesus was born. There was no year zero, bc or ad, when that was set up. The system started directly at 1 AD. This all happened during the early middle ages, and for a while people just picked their favorite feast days to begin the year: Christmas, Annunciation, or Easter. Thus, depending on where you were, and when, the year number changed on different dates. Fortunately, in several places they settled on January 1 even before they settled on which calendar to use. Scotland changed the start of the Scottish New Year to January 1 in 1600. England, Ireland and the British colonies waited to change the start of the year to January 1 until 1752. But they’d waited too long. In September of the year before, the Gregorian calendar was introduced. What happened then truly boggled the mind. Citizens in England were surprised to discover that the year 1751 was only going to have 282 days, which would begin March 25 and end normally on December 31. Ok so far. 1752 was all set to begin on January First. But according to the Gregorian calendar, in addition to settling on a new day to start the year, the calendar at some arbitrary point, had to be advanced by 11 days. So they did it. They went straight from Wednesday September 2nd, to Thursday, September 14. They had to do it so Easter would be in the right place, they said. After that, things began to settle down, and now about all people have to deal with is remembering which of those danged months have 30, and which have 31. If I had more time and all of us had longer attention spans, I’d tell you about the Chinese calendar and their New Year, the Jewish calendar and its New Year and a bunch of others. But I think it would just wear us out. And there’s still all those turkey and ham leftovers to deal with. And she drives a Ford. This is Marideth Sisco for These Ozark Hills, saying – May all your days be merry and your new year, whenever it starts, be the best one ever. This is Marideth Sisco for These Ozark Hills. I always feel when I come to the ragged end of the year that I’ve been in a year-long race, and will just barely make it to the finish. There is always too much to do, and at my age, the time goes whizzing by until sometimes I mistake the second-hand for the hour hand on the clock. This year has had its share of ups and downs for everyone, but it’s also had its blessings, and I’m thankful for them as well. Chief among the blessings here at the Home Place is my long but welcome recovery from cancer treatment. I am getting stronger, smarter (at least sometimes) and have been able to complete some long-held goals as well as start some new and very challenging projects. Of course I’m sure that before I finish I will have to say a few last words over the garden. One would think I’d said enough last month, and the gardening year is very much behind us. But with Thanksgiving just past, recent events connected to the garden’s abundance still get a big place on my list of things to be Thankful for. And I’ll tell you why. But I really should start at the top of the list. Certainly I am grateful for the longevity of old friends and relatives and the opportunities I have had in the recent weeks to celebrate with them our continuing residence on planet earth. For instance, this weekend past I journeyed over west where groups of them were gathered, and partook of the holiday cheer, the laden tables, the conversations, the loving friendships. It was a wonderful and heart-filling time. But before that, early in November but too late for November’s episode, I had an experience I want to share with you, and another reason for Thanksgiving. I drove down to Mammoth Spring, Ark, on a special errand. First, I slipped down back streets and over hills to an old cemetery, where I met with a group of local historians and Civil War buffs to celebrate the placing of a new commemorative stone on the grave of a woman known locally as Granny Blue. She’d had other names that passed, along with the husbands who gave them, into history. The man named Blue was the last. But the story was all hers. Alone on her farm just east of Mammoth Spring, on the Missouri-Arkansas line, in the midst of the fighting between north and south, a sad and terrible thing occurred. A skirmish, as it was called, resulted in the deaths of seven young men, Confederate soldiers, in her upper field. Custom and Union law dictated that they should simply lay where they had fallen. But it was such a symbol of disrespect for the fallen that Granny Blue simply couldn’t abide it. So there, in the cold of early winter, she went, along with her hired hands and a couple of slaves who volunteered, and they dug into the rocky soil seven lonely graves, and they put those young men to rest. Local history has it that there were many more out in the bleak woods. But these seven, though their names are not recorded, got a burial – one that was never remarked upon and had no marker but the one created by Nature as the area was never again planted or mowed. Attending the ceremony, to my surprise, was long-time friend and Oregon County icon Dorothy Ellis, who offered me in to her home between ceremonies for a cool drink and a bite of cake, and who socked me on the arm and said as I was leaving, “We need to visit more. And soon! I’m 90.” Hard to believe. In her heyday as Oregon County Presiding Commissioner, the diminutive Dorothy engineered the establishment of the Irish Wilderness as a state-protected space. Also on hand was retired Missouri State Trooper Lou Wehmer, who produced the reissued and annotated version of Col. William Monk’s controversial Civil War memoir. I was in good company all around. And there in the midst of the ceremony, in my mind’s eye, those unbearably young, lean-limbed, hungry and lost boys came up out of their narrow fallen-in holes, and sat on the edges, some stretching, others with a leg up and resting their arms on their knee, and all smiling, highly amused at this sudden and long unexpected recognition. They were grinning and nodding to one another, as if to say, “Would you look at this. Isn’t this something.” And the day was, for me, suddenly brighter and softer and harder to bear. And it came to me then that while griefs last long and are too easily called to mind, Joy is fleeting, and must be seized and swallowed whole, before it escapes. But mindful of history and the difference between ingrained rituals that have lost their meaning and those real events long remembered and deserving celebration, I spent the actual Thanksgiving Day alone with my dog and a grocery deli takeout dinner, counting my blessings. And among them were this summer’s canned green beans, golden potatoes from my home-grown sweets and Irish cobblers, and the last fresh, ripe scattering of tomatoes from the kitchen counter, breaded with slices of whole wheat and seasoned with butter, salt, pepper and just a dab of sugar. It was lovely and not lonely at all, surrounded as I was by all those memories close by and far in the past. It made the weekend trip all the sweeter. So many gifts we are given, and almost too much gratitude to hold.This is Marideth Sisco, offering holiday blessings to all my neighbors and friends far and near, and a heartfelt thanks for the many gifts of life in These Ozark Hills.